Living with mental illness means not only making the effort to manage it personally, but finding ways to cope with how it can affect those who are in our lives. Some do not find the support they seek in the workplace and in certain cases, may even stop working due to the impact of stigma. 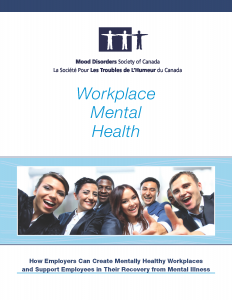 This Workplace section aims to provide both employees and employers with the information and guidance they need to promote and support positive Mental Health in the Workplace. In addition to the information below, you are invited to join our members only Mental Health in the Workplace Facebook Group, where we regularly post on current topics for discussion. Learn how to create a supportive and inclusive workplace policy and/or action plan. For more information or to request a presentation for your workplace, visit us here.